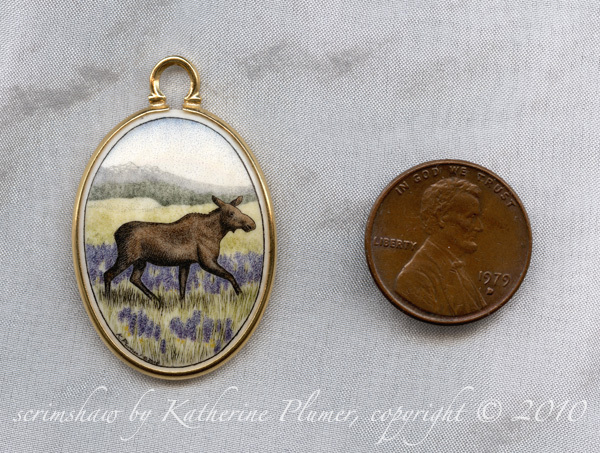 My life, under the microscope...: scrimshaw moose pendant! I'll start a new piece tomorrow, though I've changed my mind a half a dozen times today about what it will be. I need to determine how well I like to scrim on Mother of Pearl, because there could be some important business opportunities if I like it and it turns out well. I also need to focus pretty exclusively on doing work for the show in WY, so that means wildlife/western stuff (not what I had planned to put on the MOP, but now that I found the missing stuff and have FOUR of them to fiddle with, well heck, I can save my other idea for later.) So you might remember, if you've been reading this for a long time, that I once started a color scrim of a swan. Just barely started. And then got sidetracked with other projects and put it aside and never touched it again. Well, I still love the image, but I picked up that piece of ivory today with the swan outline and it's just too darn big, it's a huge piece of ivory, I don't want to make the image that big. It's a subtle image, it should be smaller. Save the big pieces for the drama and detail. So I'll start it again, this time on MOP. Unless I hate the MOP, we'll see. And I'll just repolish the ivory and do something else with it.